A school district’s board of directors plays a critical role in creating an environment for a successful school construction project. A school board that knows its constituents and community can tell when it’s right to go out for bond election to fund capital projects. That school board can also know what kind of educational program and facility program will match the community’s interests and needs. Architects for public school projects come to know that the connection between a school board and its stakeholders is very important to a school building’s design, construction, use and eventual success. The board will return to the voters to report on the success of their bond projects. The board will say here’s what we promised to do, what it would cost and when it would be finished  and here’s what we did do, what it did cost and when it was completed. It’s important to keep those original bond goals in mind during the life of a school project, even though changing conditions, new influences, rising costs and many new voices may lead to a final design quite different from any envisioned at the beginning of the process. In some cases the architect is in on the ground floor of a long-range plan for projects in a school district. In these cases the architect gets to see the grassroots source of a design program. In other cases, the architect may be selected months or years after a successful bond issue vote. For such projects, the architect needs to be aware of and understand those early commitments the school board has made to the voters. 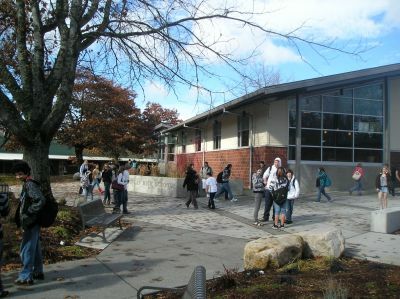 North Kitsap High School was expanded and modernized with funding from a $60 million bond issue. The school board and their bond-planning team must define goals that are specific enough to address the needs of the district and appeal to voters, yet be flexible enough to accommodate options for achieving those goals. They need to define costs that are realistic even though a detailed program and cost estimate is seldom feasible in the bond-planning stages. As each project moves to its full design phase, these bond goals need to be kept on top of all other factors guiding the project design. The original bond goals must be maintained as the primary guideposts for each project’s design development. We have examples, from our past work, of how influential and important a school board can be to school projects. The superintendent and assistant superintendent, both with their own record of successful bond campaigns at other school districts, were advising the school board that it may be too big or too soon to go after the $60 million bond issue they were considering: Either cut it in half, or wait three months until the next election. The school board members, on the other hand, were out in the community. They felt they knew their community and they said this is the time and this is the amount. Even though the previous bond election had failed in this school district, the school board was right and the bond issued passed. The successful bond issue passage provided for a transformation of all older existing facilities at the elementary, middle school and high school levels, plus a completely new high school and related site and field improvements, funded by the original bond amount and state matching funds. For their successful bond election in 2011, the school board’s program recognized the community’s interest in maintaining and improving the district’s only middle school, rather than building new. The entrance to Cascade Middle School will be reoriented away from a busy highway, meeting a goal of the Sedro-Woolley School District’s 2011 bond issue. This was also the case in the district’s successful 1995 bond election, which provided for measured improvements at all of its schools, including modernization and expansion of the historic high school. In both cases, the community supported revitalizing their existing schools over replacing them with completely new sites and facilities. The school board was responsive to their local stakeholders. The planning goals of the most recent successful bond issue at Sedro-Woolley will continue to be the guide to all the decisions being made for the Cascade Middle School project, currently under construction. 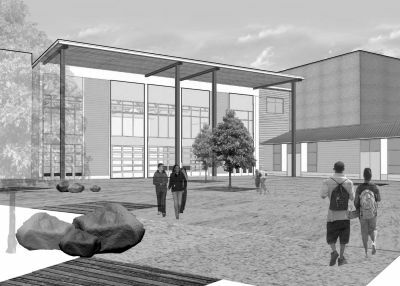 The Cascade design responds to this bond goal by applying the guidelines of the Washington Sustainable Schools Protocol. Site design includes 120,000 square feet of pervious concrete paving and eliminates the need of a constructed stormwater collection system. Site lighting with LED fixtures improves energy efficiency while improving light quality and control. Classrooms utilize a high-volume natural light and ventilation system without air conditioning. Improved vehicular traffic and pedestrian safety are achieved by relocating the main auto entrance from a busy state highway to a minor arterial. This redesign also provides the separation of auto and school bus traffic. Structural improvements are provided in the modernization of existing classrooms, and the new additions provide safety based on the latest building codes for resistance to seismic events. The layout of buildings on the site provides improved control of multiple building entrances, arranged to create protected courtyards that allow outdoor gathering spaces for students and improve the reach of natural lighting into the school’s interior spaces. The community  and voters especially  have responded positively to keeping the existing site and identity of Cascade Middle School with its expansion and modernization. This also has value in terms of sustainability through reuse of land and buildings. The reorientation of the school’s main entry had the benefit of retaining the older buildings’ identity along the traditional site entrance, while at the same time creating a contemporary and dramatic architectural appearance at the school’s new entryway, plus high-bay windows and covered portico providing a focal point for the largest new courtyard, which will be suitable for outdoor community and school events. The school also includes additional gymnasium space in response to the community’s strong support of school athletics. The school district administration worked closely with its construction management firm, the Robinson Co., and its architect to maximize potential state funding assistance. Study of multiple options resulted in funding assistance toward both existing construction and new additions. After the successful bond election, there were other forces that helped move the project’s design forward. An educational specification process allowed the school’s final users  teachers, staff, students and community  to participate in working out very specific details of the building’s functional spaces. Work to optimize state funding was a factor in the building configuration. A value-engineering process brought in other design professionals with feedback that contributed to the final design. Surveys, soils and building investigations, as well as environmental and planning review by public agencies, all provided factors in final design. By keeping the original bond-planning goals in mind, all these various, and in some cases competing, forces can be utilized by the design team to achieve a successful project and bond program. One of each school board’s responsibilities is to create a vision for the district’s schools that reflects a consensus of the entire community, administration and staff. That vision defines the district’s educational philosophy and methods that will assure the success of its students. The creation of that district-wide vision typically falls to the superintendent, who is hired by the board of directors. At a recent retirement ceremony, board member Jim Callio said the most important decision of his career was hiring of Mark J. Venn, who after nine years at Sedro-Woolley School District retires at the end of the month. With Venn’s leadership, in the midst of the recession, the Sedro-Woolley School District was able to pass a much-needed construction bond issue in 2011 when most districts were unsuccessful. The combination of a board of directors that is in touch with the members of its community, and an effective and dedicated superintendent is the winning combination that provides the leadership and guidance to make a school district’s capital programs successful. Stuart Stovin is a principal with Harthorne Hagen Architects, a full-services professional architectural firm providing planning and design for commercial and K-12 education clients in Washington State and Alaska.